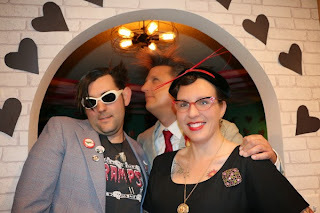 Last Saturday I attended a vintage style party called Putrid Cupid at Dr. Foemmel's House of Cheer and interviewed some of the heads creators of the party. The party started at 8 pm and ended at 4:40 am. While my iRobot gently sweeps, I'm trying here to tell you about the many events popped up during the almost 9 hours of party. “In the early 60's my great uncle Irving and great aunt Lillian brought a liquor store across the small highway from the A&W Root Beer Stand. It was a small store, and when he came back from buying the store, a local musician, concert promoter, and radio personality named Howie Sturtz, suggested he name the liquor store, Irv's House of Cheer. My aunt and uncle had a successful lifebuilt on hard work, Howie was a successful musician who has played 7,000 one-night concerts in his lifetime. My mother said Mr. Sturtz even played her high school prom. They closed the store, and in 2012, when I bought this house, I decided to name it The House of Cheer. Just like a diner, or a concert, my house is a place that brings people together. The first time we came to the House of Cheer was for a Church of Frank Sinatra. Eric and I were talking about old Sacramento Punk bands and bad movies, which ended up spawning Dive-In Theater. We watch movies projected on the wall in the back yard while swimming in the pool. This year we have 10 films slated for Dive-In Theater. 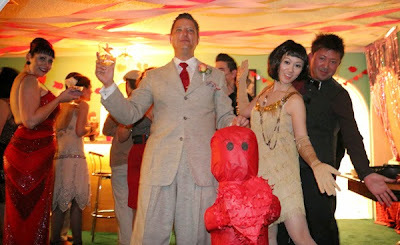 The Putrid Cupid party was fun. There were lots of people I had not met. I bar-tended for a few hours. Tracy had a Divorce Ceremony. We smashed a cupid pinata to signify all of the rotten love he had dealt to people in the last year. Dive-In Theater was the event that took us from party participants to party planners and creators. 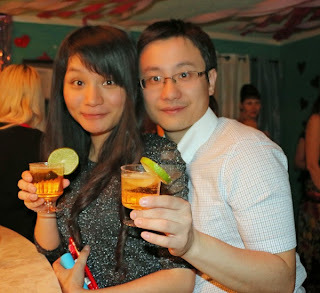 At the party were also a Chinese couple having so much fun. 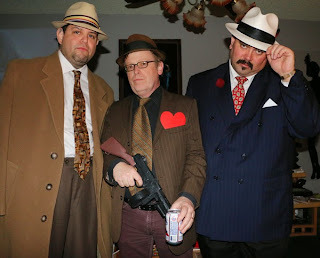 They didn't look like the rest of the party's attendees. So, I asked Eric where they come from. Eric explained it to me. He has a room he rents for people all around the world throw a company. Vivian Martian met Eric and she told me some 3 years ago, Kyle, Eric's ex-roommate introduced her to Eric. From her birthday party, which was a success, they started throwing theme parties. Talking to another girl with an interesting story on how she started attending the parties. Before she felt like she didn't fit anywhere, any group of people. But after she was invited to one of the parties, she got the feeling that, finally, she found her “people”. “I met Eric for the first time at a Fourth of July party he and his former room mate, Kyle, threw in 2013. 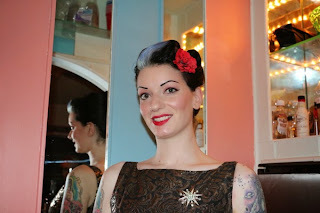 I returned to the House of Cheer alone two evenings later for my very first Church of Frank Sinatra party. That evening I engaged in a lengthy and lovely conversation with Eric about many subjects, after which he asked me for my current home address. 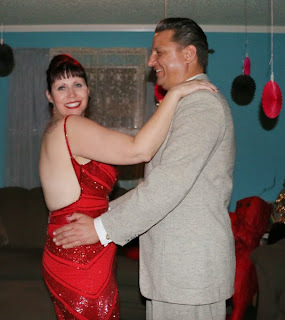 To my surprise, I received a hand written Thank You card in the mail from Eric, in which he crowned me the First Lady of Booze for the Church of Frank Sinatra, title I held and still hold in high regard. I am a liquor representative for a liquor distributor as my profession and had supplied a large supply of alcohol for both parties I had attended. I continued to attend parties at the House of Cheer and built a wonderful friendship with Eric. I heard Eric telling something very interesting and I decided to share it here. In his own words “There is a strange verve in this house. For a few months, I never know what was going to happen, or what I was going to make up to. At times, there were flouring musicians sleeping on the couch and floor. One morning I came out of my bedroom and there were people scattered on the floor and couch covered in blankets and sleeping bags. My roommate had brought them home from a dance convention. 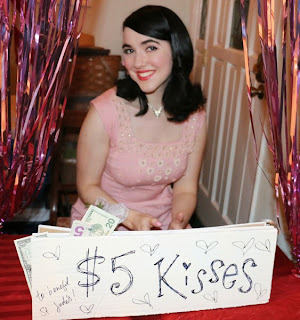 Between raffles and kisses (at the kisses booth), they were able to raise $300 for St. Jude Children's Research Hospital. 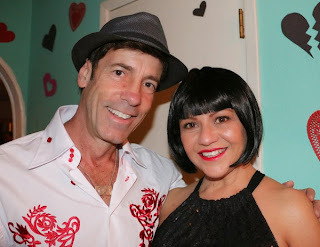 Click here to see the photos of the party.